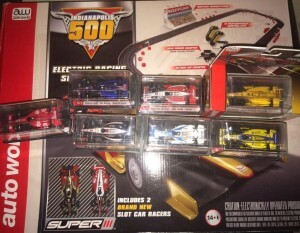 To celebrate the start of the 2015 IndyCar season I’m giving away a brand new Auto World Slot Car Set to one lucky winner. Everything in photo above is included in give-away. Congrats to #IndyCarSlotCarSet winner Rick Weber (Twitter handle @rickweber). Hope you and your family enjoy the Slot Car track! What comes to mind when I think about Indycar? Tradition. History. Emotion. Memories. Hallowed ground. Flashbacks. Heritage. Emotion. Pageantry. Milk. Back Home Again. Drama. Balloons. Enormity. Heroes. Emotion. Colors. Sounds. Speed. Emotion. These are just some of the words that come to mind when I think of what Indycar means to me. To this day I can’t make it through the pre-race ceremonies without getting choked up. I am a huge Indycar fan and a huge race fan, but the Indianapolis 500 is so much more than just a race. It is an American institution. It is a celebration. It is a rite of passage. It is magic and goosebumps. And it is where I received my passion for Indycar. In the late 70’s and early 80’s, some of my favorite childhood memories involved going to IMS for qualifications with my dad and my uncle. In 1979, I remember listening to the 500 on the radio and hearing Rick Mears win. As an eight year old, I thought it was so cool that the 500 winner shared my first name. In 1982, I remember going to Pole Day with my dad. Sadly, that was the day Gordon Smiley died in a Turn 3 accident. I remember hearing that the accident was bad. We didn’t see it since we were on the the front stretch and in those days there were no jumbotrons showing replays. But, I’ll never forget hearing the announcement an hour or so later that Smiley had been fatally injured in the crash. It was a couple hours before the track re-opened for practice. My dad and I talked for a long time after that and for him it brought back memories of when Eddie Sachs was killed during the 1964 race. My dad talked about how he had a hard time continuing his love affair with the race after Eddie Sachs was killed. Sachs was one of my dad’s favorite drivers. I went though similar emotions after Wheldon’s death at Las Vegas. But somehow (almost against all logic), Indycar has a way of pulling you back in. In 1982, I listened to the race with my dad on the radio. I was cheering for Rick Mears and I was walking laps around our dining table picturing where the duel between Johncock and Mears was taking place. Dad was leaning forward in his chair and I remember him just repeating ‘I can’t believe it’ over and over after what was at that time the closest finish in 500 history. The next year we had to be there in person. So in 1983, I finally got to go to my first Indy 500 and witness the drama in person. In 1983 the battle that year of Sneva and Big Al, with rookie Little Al a lap down (assisting his Dad late in the race by possibly blocking when his car was between Big Al and the Gas Man). As a 12 year old that year, I remember thinking that I would totally do that for my dad. I also remember that year hearing that earlier in his career that Tom Sneva had been a school teacher. As a middle school student at the time, I thought that was kind of cool. The next year, I got to see in person my radio hero from 1979 win his second 500. The following year (1985), we were sitting on wooden bleachers on the inside of turn one (these bleachers no longer exist). They weren’t very good seats overall, but we had the absolute perfect view of Danny Sullivan’s famous ‘spin and win’ as it happened right in front of us. From 1986-1989 we moved our seats and sat in the Southwest Vista. One of my favorite memories from those years was Big Al’s 4th win in 1987. I was always a fan of the Unsers, and not the Andrettis. Since then, I have had to miss some race days over the years, but I have been to 24 500’s in all and this year will be my 25th. Since 2004, my wife and I have been sitting in Stand A. I love these seats and enjoy that we are covered on rainy days and shaded on hot days. We also have a great view if the front straight, the pits, and Turn 1. Sadly, my dad passed away 14 years ago and my uncle is now gone as well, but I can still see them in their prime in my mind’s eye when I step through the gates at 16th and Georgetown. So my love for Indycar started with the Indy 500, but it quickly transferred to the entire Indycar season. For the past 5 years, I have made it in person to at least 3 Indycar races each season and I watch the rest on TV. We know to schedule family events around Indycar races. This summer, I am taking my sons to Mid-Ohio, Milwaukee and Iowa for races. In the past, I have made it to Kentucky, Kansas, Pocono and Fontana. We are also looking forward to attending the Grand Prix of Indy for the second time this year. That’s what Indycar means to me!